A fishing hat is a must have item to wear when you go fishing. It helps to protect you from the sunrays or keep you warm in the winter. Without a fishing hat, you might feel hot or cold, hence, could not focus entirely on your fishing session. 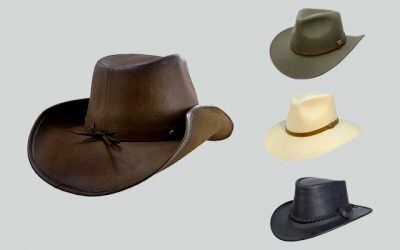 When searching for the best fishing hats and caps on the market, you might be overwhelmed by a lot of options you might have. You can choose a fishing bucket hat or a baseball cap. In addition, you can choose from cotton, polyester and nylon in different colors as well. 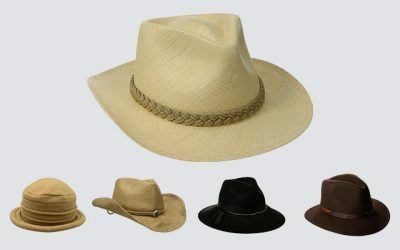 No matter what feature you would like in a fishing hat or cap, it is important that you can pick up the hat with the highest quality and construction. 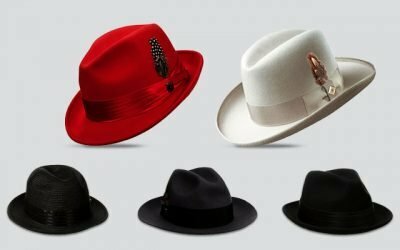 Taking a look at the review below for the best fishing hats and caps might give you more ideas and suggestions before you make an informed choice. The most common design for fishing hats is bucket design. That is the reason why bucket hats are also known as fishing hat. Hence, there are a lot of bucket fishing hats on the market and here is one of the best option. This hat is made of 100 % of cotton with metal ventilation eyelets. It is available in 2 size Small/ medium and large/ extra large. There are 16 different colors for you to choose from including navy, red, and several camouflage patterns. The material of this hat is very soft and smooth, which feels really great on your hand. It is also very lightweight and breathable. It is of the few fishing hats and caps that offer you several sizes for a better fit. This hat can be worn not only for when you go fishing but also when you participate in any other outdoor activities. There is a chin cord attached to the hat to make it stay secured on your head. It also has snaps on both sides of the hat and a nice drawstring with an adjustable slider for the hat to stay even more secure. The brim of the hat might become flimsy and will block your view when it is windy. This fisherman hat is made of 100 % of polyester with a head net which is made from mesh material. The width of the brim is 3.5 inches. It is available in 1 size with the inner circumference of 23 inches. It is available in several colors such as dark grey, pink and blue with the same colors for the head net. There is a chinstrap with cord lock attached to the hat. This hat has a wide brim to cover a large area of your face, your ears and your neck. It is also rated 50 + for its excellent sun protection so you can prevent sunburn effectively with this hat. 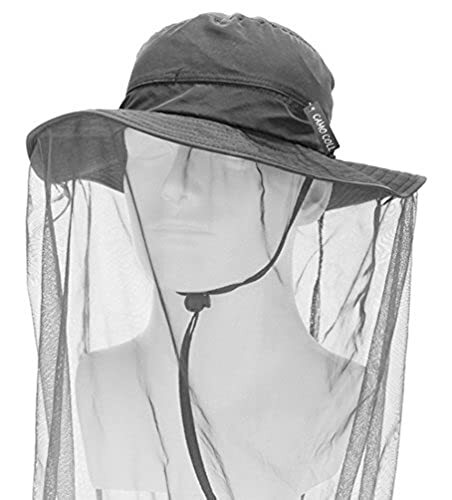 If the area where you go fishing is full of mosquitoes and insects, this hat with a long net to cover your face and your upper body will effectively prevent these annoying bugs from getting inside. 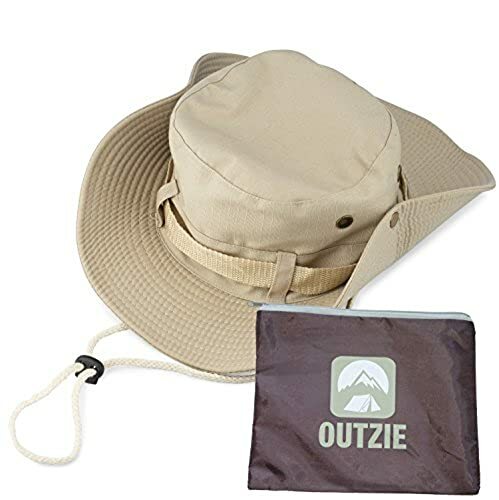 This hat can be folded and packed into a small bag for easy storage and carrying around. The material of this hat is super lightweight and durable. It is also water resistant and has a quick drying performance. The brim of this hat is quite soft, which can be flipped up during a strong wind. If you choose a hat with beige color, it will be harder to see through the net. Here comes another fishing bucket hat with premium quality. This hat is made of 100 % of lightweight cotton. There are 2 colors of the hats for you to choose from including tan color and beige color. It is available in three sizes including medium, large and extra large. The brim of this fishing hat is very wide, which can help to bring a lot of shades for your ears, your neck and your face. In shady days, youc an snap up the brim so that it would block your view. In addition, it is rated UPF 50 + so that it can block 99% of the UVA and UVB sunrays and prevent sun burn as well as skin damage effectively. The material of the hat is also very lightweight and comfortable. It is also well ventilated thanks to the ventilation eyelets. This hat is packable. It comes along with a nylon travel bag for you to put the hat in for convenient storage and carrying around. You can wear the hat not only for when you go fishing but also when you do gardening, hiking or taking part in all outdoor activities. Finally, this hat can be wash both by hand and with the washing machine. It can also dry quickly. There are 2 colors of the same tone for you to choose from. Not to mention that tan and beige colors can spot on dirtiness easily. The Columbia Company is famous for producing high quality headwear and this hat is of no exception. 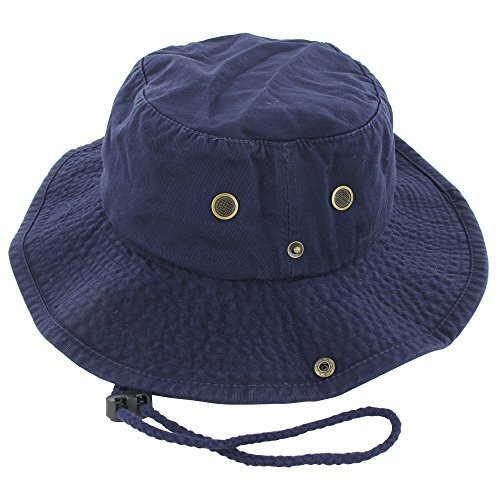 This Columbia fishing hat is made of 100 % of textured nylon Poplin. It features an adjustable draw cord and toggle at the back. There are several colors for you to choose from including grey, red and blue. It is available in 1 size. There is an adjustable chin strap attached to the hat as well. With your hat, you can experience the high quality material and innovative technology that are used to make into a Columbia hat including the Omni-wick sweatband and Omni-shade UPF 50 sun protection. The material of the hat is of premium quality to be very lightweight and comfortable. Along with the mesh panel, the hat offers you the best air ventilation to keep you cool all day long. The internal sweatband is effective in term of preventing moisture from getting into your eyes. It can be dried quickly and has a high resistant against water so that you can wear it in the light rain. The brim is quite soft so that you can fold the hat and put it into a small bag. The brim can stay up in shape quite well in the light wind. However, when it is super windy, it would flip up and down and block your view. This fishing cap is made of 65 % of cotton and 35 % of nylon. There are several colors for you to choose from including navy, khaki and other patterns such as digital camouflage and desert camouflage. It is available in 1 size that can fits up to the head circumference of 23.5 inches. There is an adjustable strap. There is also a long neck flap of 7 inches in length. 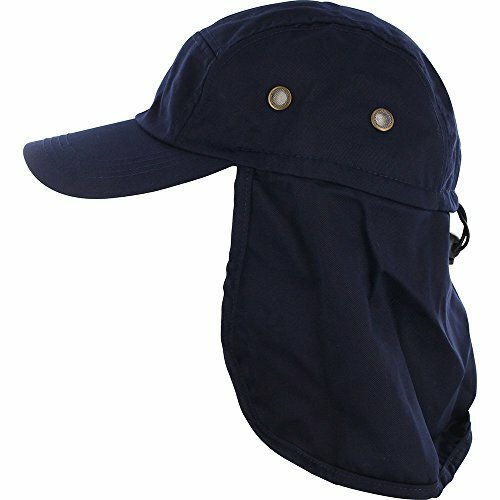 This fishing cap provides a lot of protection for your ears, neck and face against the harmful sunrays. It is also capable of keeping these parts warm in the cold winter days and nights. It has the strengths from both of the materials. It is soft and lightweight with good air ventilation while being very durable and can stand well against all types of weather. You can wear this cap not only for fishing but also for hiking and camping. This cap is easily cared as you can wash it in the washing machine and it would not shrink. It also has a quick drying performance. The neck flap is irremovable. 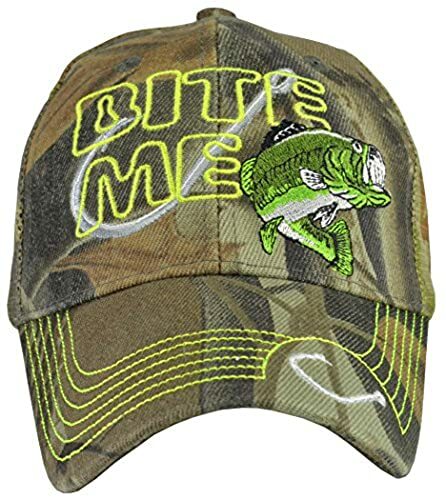 If you like bass fishing, you might also like bass fishing hats with an image of a bass stitched on the front of the hat’s crown like this one. This hat is made of 100 % of cotton with a nylon mesh area at the back of the hat. It comes with Buckram and pre-curved bill as well as the Velcro closure system. It is available in one size. It features one of the most iconic and original KC Caps embroidery designs that you would not find in other hats on the market. The hat has ventilation eyelets and mesh back to make it cooler and more breathable for you in a hot summer day. 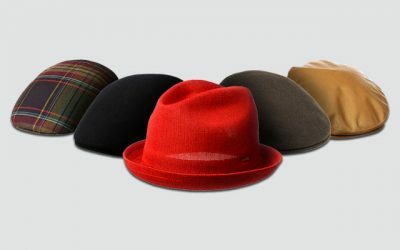 The material of the hat is very thick, firm and durable but it is still soft and breathable. 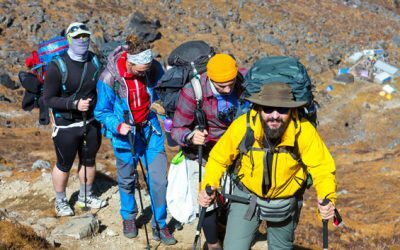 The internal sweatband of the hat is made of the deluxe 4 needle material to be of high quality and effective in term of ventilating air and preventing your sweat from getting into your eyes. This hat should be hand washed only otherwise it will shrink and the quality of the hat would be deteriorated. 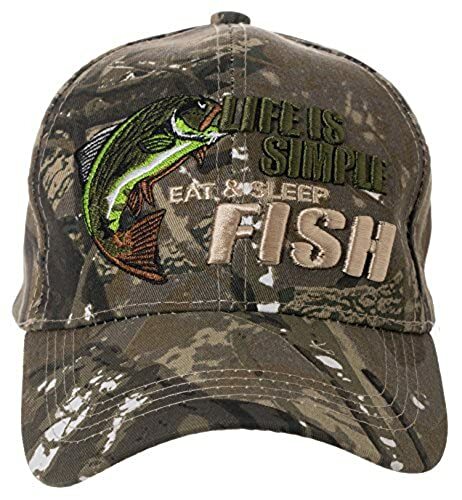 If you are looking for hats with fish on them to show everyone that you are an angler or fisherman, take a look at this hat. It features a classic trucker hat design with an image of a fish and the letters “Bite Me” embroidered on the front of the crown. This hat is made of 100 % of acrylic. It is available in 1 size with an adjustable strap to fit most. There are different embroidered quotes for you to choose from including Bite Me or Born to Fish. In fact it is available in 6 styles and colors for you to choose from. The hat has a solid and sturdy construction with a stiff brim. 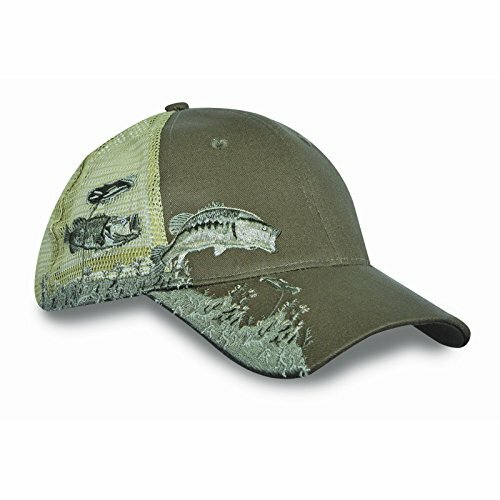 This hat is a great gift for anyone who is proud to be a fisherman or angler. It is of unisex style, which can be worn by both men and women. 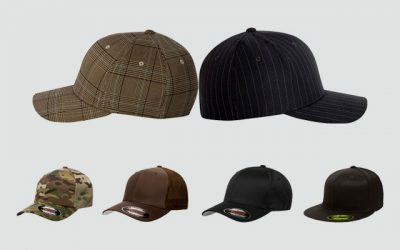 In addition, you can wear the hat not only when you go fishing but also when you go out with your casual everyday wear. This hat is available in one size only. The embroidered part of the hat might make it become hot, especially when you have to sit for a long time to wait for a fish to bite. 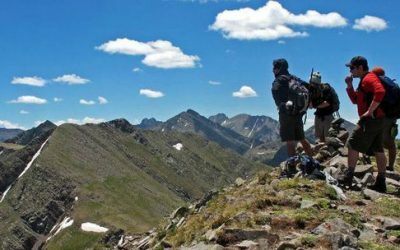 If you have been searching for fly fishing equipment and fly fishing hats before, you might have heard about Leland, which is one of the most reputational companies for fly fishing gear. Therefore, when you need a fly fishing hat, this hat is definitely worth considering. 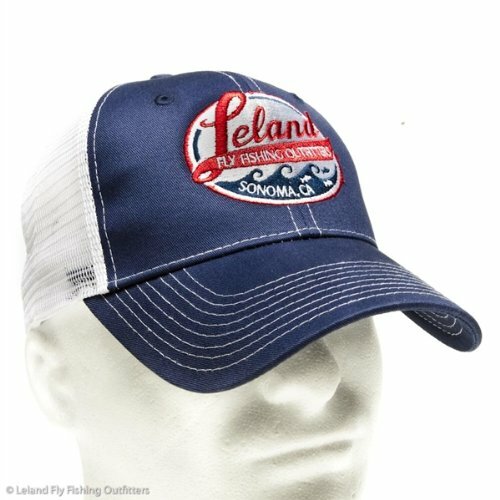 It is made of 100 % of cotton with the logo of Leland embroidered on the front of the crown. There is a mesh area on the back of the hat. It features a classic low profile trucker hat design with an adjustable snap on the back for a better fit. The material of this hat is made of high quality cotton to be very soft and lightweight. Along with the mesh area on the back, it is also very breathable and well ventilated to keep you cool all of the time. The internal sweatband is also of high quality so that it can effectively wick moisture and present sweat from getting into your eyes. You don’t have to bother wiping your sweat from your eyes while fishing anymore. The color of the hat is very sharp and vivid. They are also very durable and will not fade away easily. The mesh area is in white color, which might collect dirt and show up dirtiness easily. Here comes another style of fishing hats with fish on them. This hat is made of 100 % of cotton featuring the classic design of a baseball hat. Along with the image of the hat embroidered on the front of the crown, there is a quote “Life is simple- & fish” embroidered on the hat as well. This hat is available in camouflage pattern with 1 size that fits most. It comes with an adjustable Velcro strap. The image and quote are embroidered nicely with quality stitching and no loose threads. The material of the hat is also very lightweight and breathable. The construction of the hat is very firm and solid with a stiff brim. Nevertheless, the brim can still be bent if you prefer. This hat makes a fun and great gift for your friends or family members whose hobby is fishing or who is a full time fisherman. There is only 1 color and 1 size for you to choose from. The quote is quite hard to see at first as it is covered by the camouflage pattern. 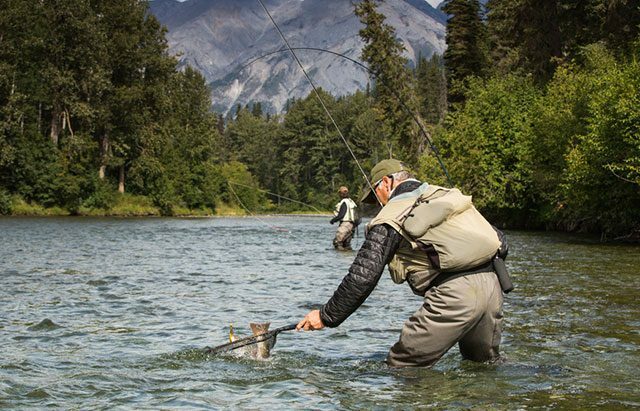 A typical fishing hat might come in a form of a bucket hat or a baseball cap, whichever you prefer. 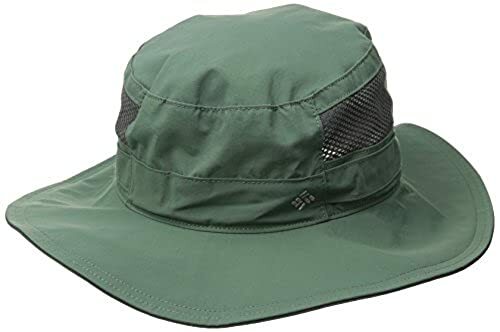 However, you should pick a high quality one with goof material and construction as that type of hat could be able to protect you from the harsh sun rays and keep your cool and comfortable all of the time while you are fishing. Therefore, it is definitely a worthwhile investment in a good fishing hat or cap. 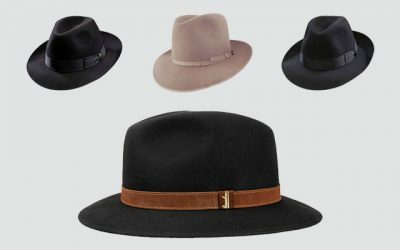 I hope with my review above, you would be able to pick up the right hat for your style and preference. Along with the hat, I hope you also have a lot of fun time fishing in the future. I regularly order from your shop and i love you products.